SPRINGFIELD, TN--(MARKET WIRE)--Mar 24, 2006 -- Spider Technologies, Inc., a company partly owned by eMax Holdings Corporation, signs a reseller and distribution agreement to sell Dr Robot's products. 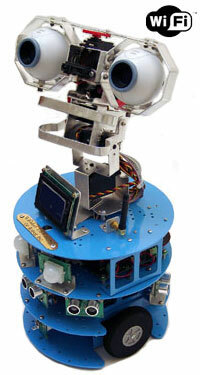 Spider Technologies, Inc. is Dr Robot's first US based Distributor and Reseller. Spider Technologies is now experimenting and developing artificial intelligence technologies that will work seamlessly with robots designed and built by Dr Robot, Inc.
Michael Reynolds, President and CEO of Spider Technologies, Inc. stated, "Artificial Intelligent products or services are the wave of the future. This technology alone is incredible. The ability now to combine this technology into one of the highest quality commercial grade robots opens many possibilities." "We are very interested in partnering with Spider who has broad IT technology background and shares the same robot vision. Dr Robot's network-based robot architecture and robotic system will be an ideal foundation for an AI technology development company, like Spider Technologies, Inc., to explore and develop powerful and high level robotic applications and services," Dr. Haipeng Xie, CTO of Dr Robot, Inc. said. Dr Robot has recently been promoting their $6300 security robot for the home, Sentinel. This is another example of technology companies combining their complementary efforts to advance the robot agenda. UPDATE: Spider technologies has started a website, Spider Store, to sell their services along with Dr Robot machines and accessories.